zCover Inc, the leading manufacturer of fashionable silicone protective cases, has announced today the zCover iSA Fashionable Silicone Protective Case for the new iPod video 30GB/80GB. As the Only iPOD Protection Case Nominated up to now by Macworld Awards 2006 as editor choice in iPod Accessory Category, zCover iSA 5G series provide the ultimate protection for the new iPod 30GB/80GB. Each zCover "iSA" retail pack contains one protective case, one hard crystal clear Screen Protector and a removable rotary Belt Clip. 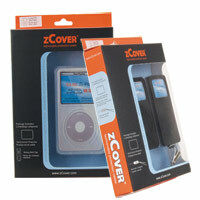 zCover is offering a selection of ORIGINAL, DUET and TOUGH patterns to the consumer. "Everyone knows that Apple is an innovator." said Sean Sa, Vice President of zCover Inc. "In presenting its iSA series protection cases to iPod users, zCover aspired to be the quintessence of the industry with its amazing range of products, its promptness and efficiency in adapting to ever-changing consumer needs, its innovative and adventurous spirit, and the consummate artistry of its products. We have received a lot of feedback from our customers and are looking forward to translating some of the inspirations into more stunning future products."